The average American spends 25 years sleeping. That translates into about 2,000 dreams per year! We bet the number is north of that for clients of Patricia McLean Interiors (www.mcleaninteriors.com). 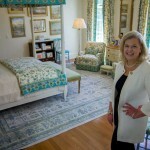 The famed designer – whose resume includes restoring the Georgia Governor’s Mansion ballroom – recently designed a dreamy guest suite for the 2015 ASO Decorators’ Show House & Gardens. LEFKO Design + Build was honored to partner with McLean to execute the build-out. In this inaugural edition of “Interior Monologues,” McLean discusses becalming bedrooms, TV or no TV, and why you really need to choose a headboard. Q: Biggest considerations when designing a bedroom? A: The scope of the job is determined by the size and shape of the room. I always draw it out and look at various layouts. The size bed preferred is always the first question for the client or myself, in the case of the Show House. The placement of the bed is sometimes based on the size walls that exist. I like using pretty rugs in bedrooms so you can next determine the size and placement of the rugs, as was the case in the 2015 Atlanta Symphony Guest Suite I designed. I incorporated two rugs in the room. 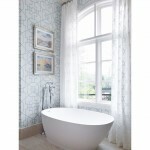 Window treatments are an important element in rooms I design. This room had two window shapes so I sketched two distinctly different solutions for the windows. Determination of placement of furniture comes next. Then I shop for just the right mix of painted versus wood finishes and a mixture of antiques and newly made items. I usually sprinkle in a bit of gilt on mirrors, frames, lighting or framed art for good measure. The magic is in the mix! Q: What dictates a bedroom’s color? A: Any palette the client prefers can be adapted. It is in the placement and amount of color used that the right mood is established. 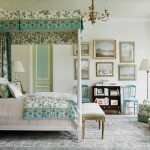 I tend to use blues, greens and golds in bedrooms because I like that palette and find it restful. 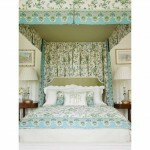 However, the most recent Show House fabric had a bright teal border on the fabric I used all around the room. I used blue and green on the doors. I had a patterned, green wallpaper on the ceiling. Reading about it, it sounds really loud. Visitors entering the room commented on how calming and restful it felt. It is the way you use the colors that determines a successful outcome. A: Client preference totally. I have worked TVs into armoires, walls, and custom pop-ups. I just did a room with no TV, in the ASO Show House and [the subject] never came up, with thousands of visitors coming through to tour. Laptops and smart devices can play TV shows and movies now, so maybe we can leave them off the drawing board! Q: No. 1 bedroom design mistakes people make? A: Honestly, I cannot tell you the number of nice homes I have visited in my career where there is not a headboard because they cannot determine what style they want. I just say please have something. Q: Favorite part about participating in ASO Decorator’s Show House? A: There is nothing like designing a space and having visitors stand in your room and experience your design vision. I feel there is something magical about show houses. I always love visiting the rooms myself after they are complete. When visitors tour it is really fun to watch them enter, and then watch them take in all the aspects of the design. There is nothing like having someone see a room that you have designed in toto. Q: Biggest challenge in restoring the Governor’s Mansion ballroom? A: The Governor’s Mansion Ballroom had water damage from a fire. The wallpaper was a complete loss. I began with a strie stripe, tone-on-tone paint treatment that would stand the test of time. The room is on the lower level and only has one window at the end. I had to be sure the draperies were classic and “knock out” good looking at the same time. I wanted an established look but my own original design. I commissioned a firm in New York to hand carve a wooden pelmet with a fruit design reminiscent of one on a mirror that existed in the Mansion’s antique collection. It was then gilted to look antique. I had just revisited the White House and used a book I bought there to come up with the design of the valance and swags. That window treatment is still one of the favorites I have designed.